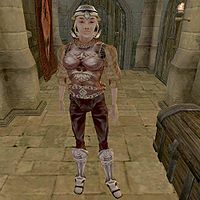 Solea Nuccusius is an Imperial battlemage serving as a guard in the Prison Towers of Moonmoth Legion Fort near Balmora. Since there is nobody currently being held there, her main duties consist of keeping an eye on the Chest marked "Evidence", where your stolen goods will be stored if you are arrested in the area. To supplement the wages for this cushy job, she's taken to selling her selection of spells to anyone that needs them. She doesn't care if you just got arrested, though she will care if you're a fellow Legionnaire and aren't wearing your uniform. Getting to her may be a little confusing, since there are numerous "Prison Tower" doors in Fort Moonmoth. She can be found behind a standard door in the same room that Larrius Varro is in. In her dialogue, Solea will mistakenly claim to be able to train you in her skills and make spells to your specifications.